Hearty turkey and bean chili is topped with a cool and creamy Sriracha Greek yogurt sauce. Filled with protein-packed turkey, bell peppers and sweet corn, this warm and satisfying chili is the ideal late-summer, early fall dish. Topped with a cool, creamy and slightly spicy Sriracha yogurt sauce, try this chili as an ideal make-ahead lunch or a cozy fall dinner. 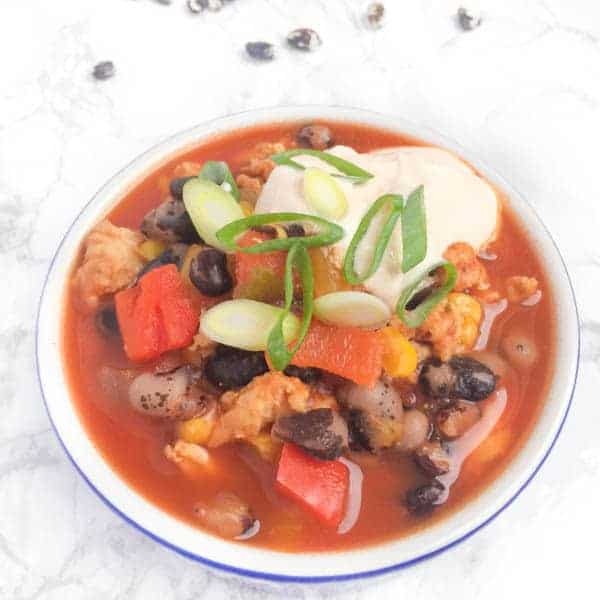 Of course, the star of this chili is the humble, yet beautiful orca bean, one of Bob’s Red Mill’s newest products discovered by my BFF Bob himself. Check out this cool video where Bob tells you his favorite way to enjoy them. When my friends at Stonyfield challenged us to create a recipe using both yogurt and beans, I immediately knew I had to make soup. We love topping stews, soups and chilis with plain yogurt (regular or Greek!) because the tart, tanginess balances the spicy, savory flavors of the dish. Plus, it is a great way to cool down dinner quickly so hungry toddlers don’t burn their tongues. 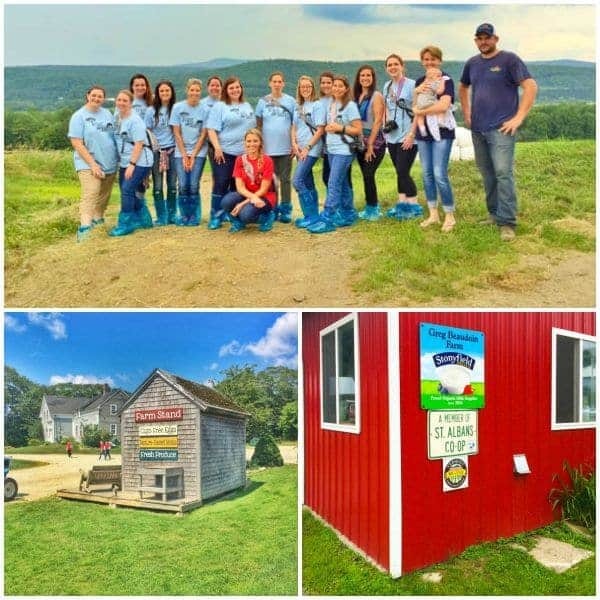 Speaking of yogurt, immediately after I visited with Bob’s Red Mill in Portland last month, I hopped on a red-eye to hang out with my friends at Stonyfield in New Hampshire for a crazy three-day four tour! Having toured many conventional dairy farms in the past, it was such a great opportunity to tour several organic dairy farms for the first time. Once thing is certain, few people are harder working, more passionate or more dedicated to feeding our country than dairy farmers. Working 24/7 with no days off or holidays (cows have babies any time of day, any day of the year just like we do! ), I am so grateful to all of the dairy farmers who give selflessly to feed America. Luckily, we also had time for a bit of recreation during our visit to Portland, Maine. 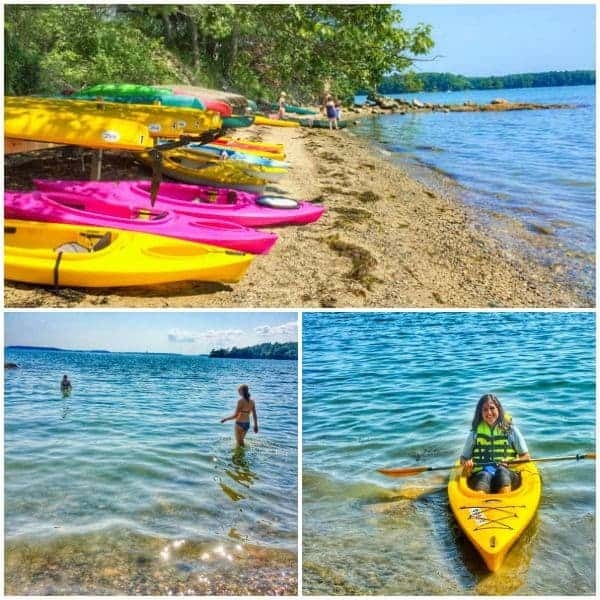 I hadn’t been kayaking in Casco Bay since college and it was so great to get back in that crystal blue water with new friends. Enjoy the last few days of summer my friends and enjoy this chili! Heat large stock pot over medium high heat and spray with non-stick spray. Sauté onion, garlic and peppers until they start to soft, about 4-5 minutes, stirring frequently. Add ground turkey and spices to the pan (cumin through pepper) and cook until turkey is browned, 7-9 minutes. Stir in Worcestershire sauce, chipotle peppers and BBQ sauce. Continue cooking until all liquid is absorbed and turkey is golden brown. Add beer to the pot and use a wooden spoon to deglaze any browned bits at the bottom of the pan. Stir in chicken broth and tomatoes then bring pot to a boil. Reduce heat to a simmer and stir in cooked orca beans and corn. Simmer for 20 minutes or longer. While chili is simmering, mix together Sriracha and plain Greek yogurt in a small dish for serving. Can be stored in an air-tight container for up to 5 days. Freezes well! Disclosure: I am honored to be a Stonyfield brand ambassador and have been compensated for my time to develop this recipe in partnership with Bob’s Red Mill. They hosted me during my visit to New England. Thank you for supporting the brands that make The Lemon Bowl possible. All thoughts are my own. Need more fall favorites? You’ll definitely find something on my Soups board! Follow The Lemon Bowl | Liz Della Croce’s board Soups on Pinterest. I love turkey chili! And yogurt is a great alternative to sour cream for cooling down the spice. I’m thinking I need to make another batch now that it’s officially fall! I love what you did w the beans! I so wish I could’ve attended the Farm Tour this year. Looks like fun. I hope you can attend one day – it was a great trip! Did you mean TB where it states tomatoes BBQ sauce? Thx! Hmm…It calls for BBQ sauce accurately. What is TB? Oh. I’m not a big fan of turkey, but I think you’ve just completely sold it to me with this… I have a mighty need! I hope you love it! We use bison a lot too! So, you pretty much had me at Sriracha yogurt. ;) And I couldn’t agree more about our country’s dairy farmers! I had the privilege to visit a few local dairy farms just this past week in Ohio’s Amish country. Such an amazing and educational experience! haha Isn’t Sriracha yogurt the best?? You take the most stunning travel photographs, Liz! There’s nothing better than sour cream mixed into a steamy bowl of soup. My fav! You are so sweet- thank you so much friend! Hi Liz, this looks super tasty! Would the taste change so much if I removed the Worcestershire sauce? Nope you can totally leave it out! Enjoy Liv! I love topping soups with yogurt! It’s my favorite topping, tangier and healthier than sour cream! Plus the spiciness, good call for sure. Yes girl!! I top almost every soup with yogurt! Looks like a great trip! 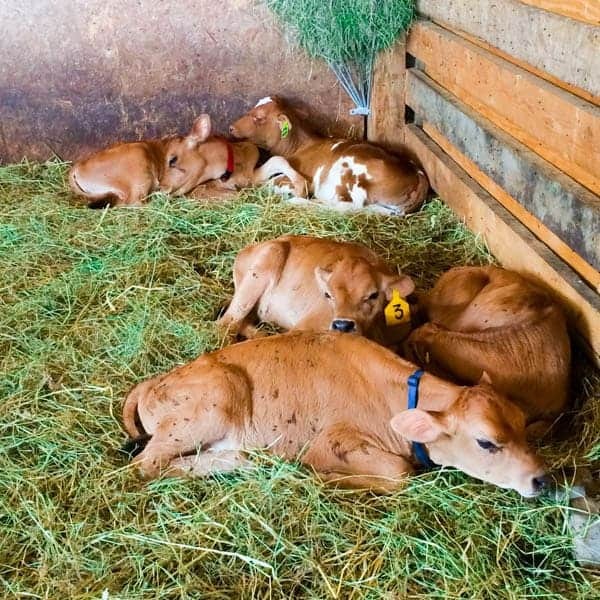 I want to snuggle those baby cows! 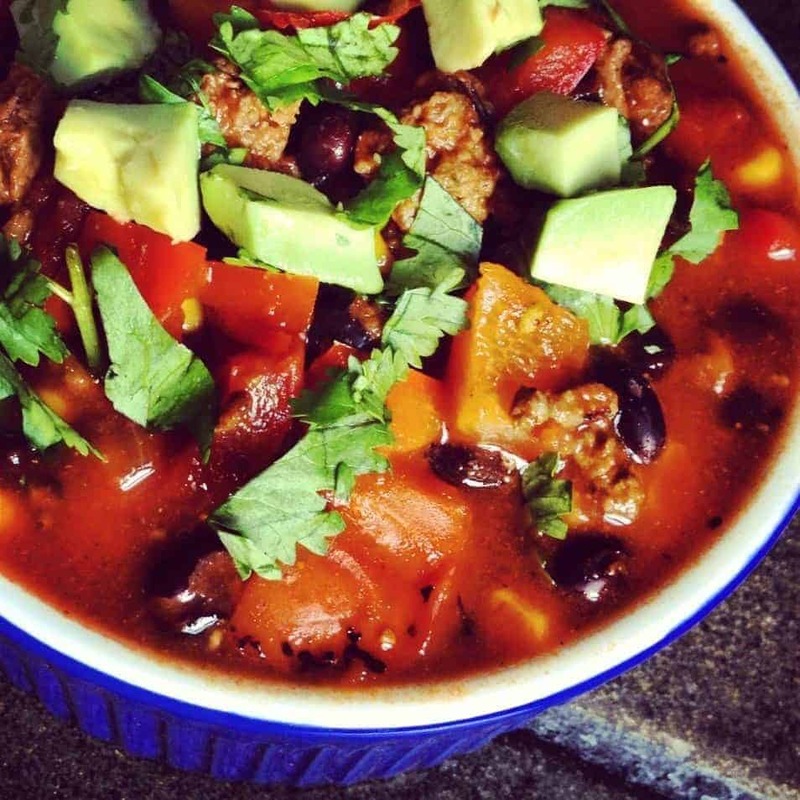 Mmmmmm…..a bowl of this turkey chili and I would be in my ultimate happy place! Looks amazing, friend! Heck yes sista!! Come over and dig in with me! 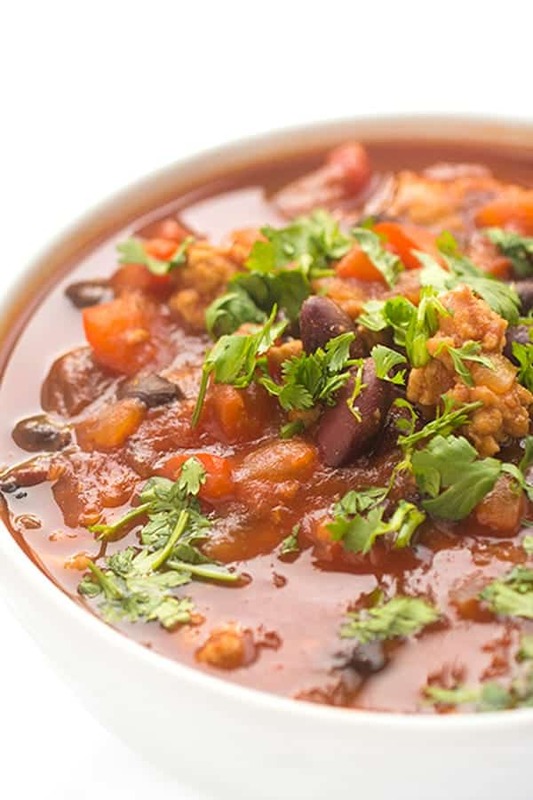 I love turkey chili and this looks like an excellent variation to the one I normally make. I’m sure the yogurt sauce is healthier than the sour cream I normally top it with too. It’s the perfect fall comfort food! 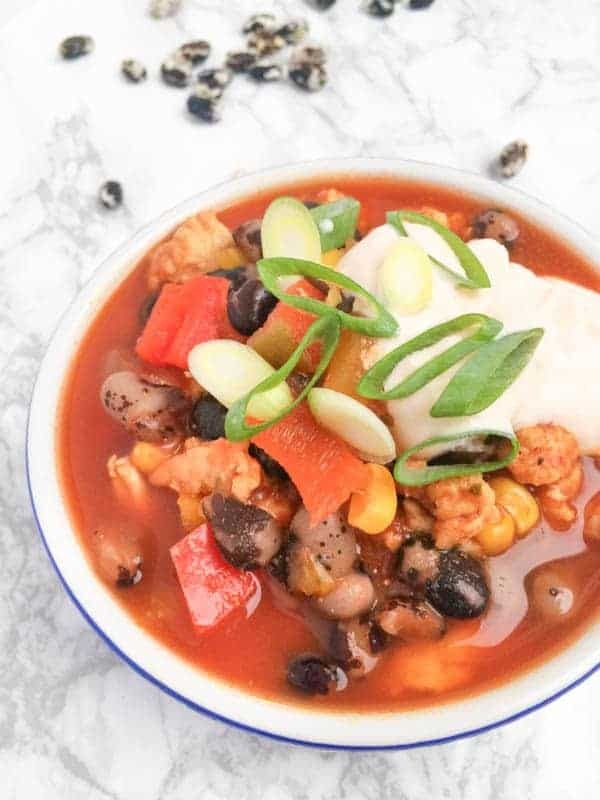 I am a sucker for novel bean varieties and love that you added them to this healthy, flavorful chili! A perfect recipe to welcome the chill of fall! You and me both Toni!! I love trying new beans! We had so much fun with the cows!! Yum!!!!!!!!! I love Sriracha!!! This sounds delicious!!!!!!!! Is there anything better than Sriracha? ?